A 180° panorama of Calico Hills at Red Rock Canyon Conservation Area, Nevada, USA. Stitched together from 21 handheld shots. For some scale, the people in the center of the photo are less than 30 meters away from me. A 270° panorama of the Bellagio fountain show at night in Las Vegas, Nevada, USA. This panorama was stitched together from a 15 minute series of handheld shots taken atop one of the large balustrades surrounding the Bellagio's fountain pool. Casinos in the photo from left to right: Flamingo, Bally's, Paris, Cosmopolitan, Bellagio. 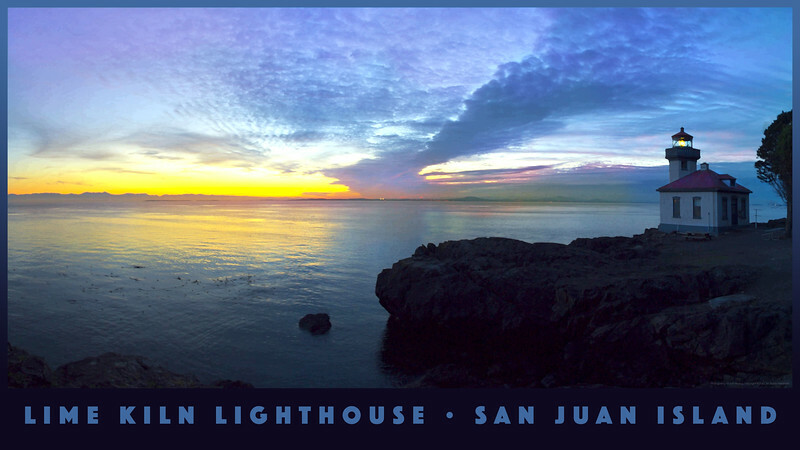 Panorama at the Lime Kiln Lighthouse on San Juan Island, Washington, USA. 360° panorama of the Himalayas along the trekking route to Gokyo Ri near Namche Bazaar, Nepal. This is not a very good image when enlarged since it was taken without a tripod and stitched from film scans. This view of Vancouver no longer exists. The Inner Harbour now has boathouses where these docks once were. The skyline has more buildings, the boat traffic increased and the water never appears this calm now. This photo is a 30-second exposure using a Hasselblad XPan. The resulting 65mm x 24mm image film positive was scanned using a Canoscan FS4000US film scanner. Note the man with the stroller is in the photo 3 times. The view from the top of Mt. Maunganui, New Zealand.